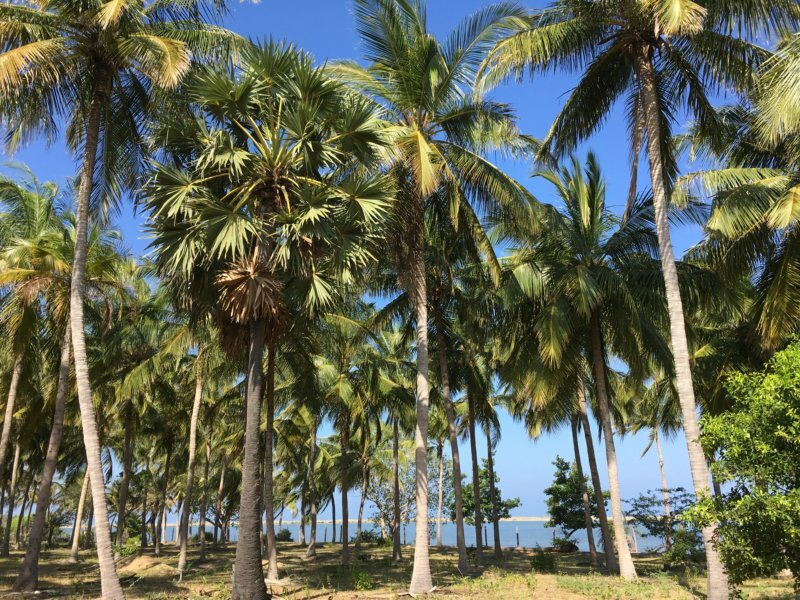 In this post I will show you Sri Lanka West Coast from Colombo to Kalpitiya. We are using a private car but buses use the same road. After exploring Colombo temples we will drive to Negombo and see fishermen at work and fish being dried outdoors on the hot ground. We will have lunch at Negombo and see the beaches. After that follow cows, rice fields and temples. The idyllic Kalpitiya Peninsula is our destination. Kalpitiya has white-sand beaches on both sides backed by coconut palms – that they also use for house roofs. We stayed in a blue and white villa with a coconut leaf roof, partly outdoors and sleeping inside mosquito nets. We were touring the coast with a car and a driver that we had for our whole stay in Sri Lanka. If you want to know how we did that check out my post What to See in Sri Lanka. The West Coast is where we started our trip after landing in Colombo where the main airport is. This is what most travelers do so this post will give you ideas on what to do on your first days in Sri Lanka. This Sri Lanka West Coast map shows our 175 km drive from Colombo to Kalpitiya. In fact we started 6 km south of Colombo where our first night hotel was located. I will show the hotel in this post. 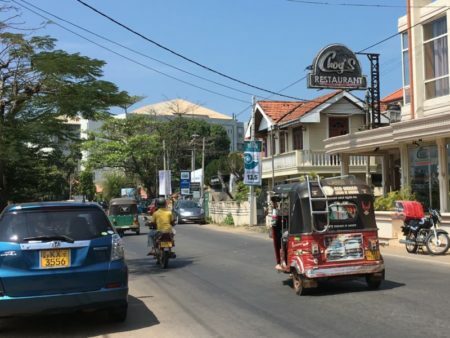 After exploring a little bit of Colombo we took the slower coastal road to Negombo and on to Kalpitiya Peninsula a couple of hours further north. Alternatively you can take the motorway straight to Negombo but I would say small roads are better. You will get the real touch of Sri Lanka beginning from your first days when passing through local villages that follow each other up to Negombo. You will also get a feeling of the busy traffic that is so typical of Sri Lanka. After Negombo you will suddenly dive into the countryside and see more open farmland. Coconut palms, pretty lakes and temples of all main religions of Sri Lanka. Kalpitiya Peninsula again has some more villages – and lots of cows on the road. You will see it later. Colombo originally was not on our travel itinerary but since we were bound to drive though it we asked our driver show us some sights. No problem he replied, but we needed to start early to get there before the crowds. It was Sunday and Sri Lanka’s National Day, February 4. 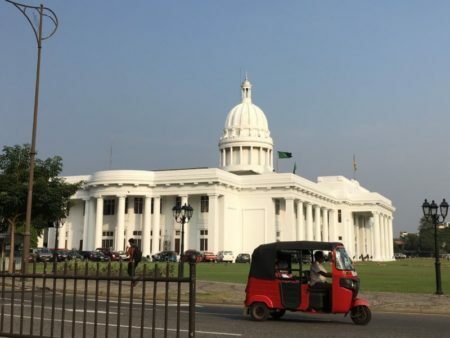 The country was going to celebrate its 70 years independence after the British left in 1948 and all politicians and crowds of Sri Lankans were gathering to Central Colombo later during the day. No crowds yet but it will be! Apparently no Memorial Hall festivities yet so we left towards South Beira Lake in the city center. The lake is green and has a small island in the middle, and a beautiful Buddhist shrine. This is the Seema Malaka Buddhist temple, located on a small island but connected to the lakeshore by a walkway so getting there was super easy, we just paid a small fee and took off our shoes. It’s a rule that you always enter Buddhist temples barefoot. That is not a problem – in the morning. But in the afternoon the sun heats the ground simply too hot to walk on. However after visiting a certain number of temples we got used to our soles burning and the hot ground almost felt good. We sat down in the car and enjoyed air-conditioning. Driver Mac allowed us one more Colombo sight before driving on: the Buddhist Gangaramaya Temple almost next door to Seema Malaka. That was a really large temple complex on a shady side street, controversially right within the modern city. But what about the temple itself? Whoever planned it had been given free hands to mix Buddhist and Indian styles. Or what do you think about the wall decorations in the shrine’s main image house (see below)? But we had to say goodbye to this modern city hidden temple and the statues. We picked our shoes and went on. Sunday morning in Colombo was a relaxing experience but otherwise the city is crowded, noisy and chaotic which we saw later, on the way back to the airport. A lot of traffic and people rushing in all directions, markets, bazaars, trains, buses and tuk tuks packed with people. Colombo is a mixture of cultures and building styles. First came the Muslims that built their trading port in Colombo, conveniently located along their east-west trading route, then came the Portuguese that added a fort and later on the British added a harbor. The Colmobo of today is the commercial capital of Sri Lanka and the political capital is the pretty unknown Sri Jayawardenepura Kotte located east of Colombo. And – since Colombo is gateway to Sri Lanka, there is a good choice of hotels. Most tourists stay here a night or two before going on an island tour or to West or South Coast tourist resorts. After landing we stayed our first night south of downtown Colombo. It was an oceanside hotel, Mirage Colombo, with an outdoor pool up on the second floor and a splendid ocean beach in front, behind a road and a railway line that were easy to cross. As we arrived after sunset and left early morning we didn’t have time to use those facilities, we only dined, had our breakfast and slept away our sleepless night spent on the plane and in an airport lounge. The room was good and so was the buffet with both Sri Lankan and international dishes. This hotel really made us feel at home, far away in Asia: the first people we met were a bus group of Norwegian travelers heading to a Sri Lanka tour. Their group leader told me about travel in Sri Lanka and explained local habits, all in Swedish! You can find more information on our first Sri Lanka hotel on the Hotel Mirage Colombo website. 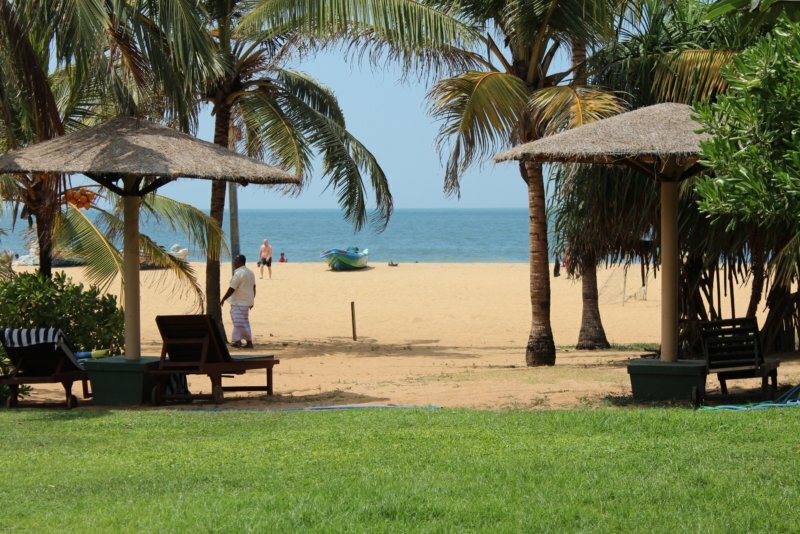 Negombo is the north end of the tourist-oriented West Coast that in the south begins at Hikkaduwa. This coastal strip has hundreds of hotels along the sandy shoreline and is yet a living Sri Lankan area. In Negombo fishermen catch fish in the Indian Ocean and repair their nets on the sheltered lagoon. This man is one of them, working in the center of Negombo. Negombo lagoon is what you first see when landing in Sri Lanka, the airport is just behind it. No wonder tourists choose to stay in Negombo, at least a night or two before heading inland to where the sights are. But these fishermen don’t care, they go on doing their work. Where does all this fish come from? The fishermen we saw on the lagoon side catch it in the Incian Ocean. They bring the fish to the hot sand dunes on the Ocean side where they dry it. They salt the fish and leave it in the strong sunlight for a couple of days. These women are are busy sorting drying fish and turning the fish where needed. Learning how dried fish is being prepared we started to feel hungry, but maybe not fish for lunch this time. Instead we took our car again and went for a hotel lunch. We took a buffet lunch right on Negombo Beach, in the Goldi Sands Hotel. I didn’t really think about using hotel lunches before, it was our travel agency that found it out for us. Hotel lunches on the road in countries like Sri Lanka instead of simple roadside eateries definitely is a good idea. Hotel lunches also offer you an air conditioned and relaxing break. We sat a long while gazing at the beach and as always I first remembered my camera when we had almost finished and it was dessert time. I felt I could stay here the rest of the day, on soft Negombo sands or maybe by the pool. What could be a better way to spend Sri Lanka’s National Day than enjoying what the country’s nature offers? But there was another beach and pool to come and we were looking forward to that. Our destination was Kalpitiya and the magnificent Villa Kalpitiya that you will see after a while. But this hotel too looked very good in all respects and the buffet lunch was delicious. And we drank a lot of sparkling water which you need to do in a hot climate. Sparkling or not, you need water. After Negombo we finally got to the countryside which was what we came to this country for! Pure, green nature all the way on roadsides: rice fields and coconut plantations. We now passed less villages but all villages we went through had a temple or church, or many of them. And the West Coast temples are so beautiful! Hindu or maybe Buddhist shrine? Then we reached the peninsula! Kalpitiya Peninsula is a long, narrow strip of land between the Indian Ocean and Puttalam Lagoon. Unspoilt, white, sheltered beaches backed by coconut groves, wherever you look and on both sides of the road. Why did we get here first now? 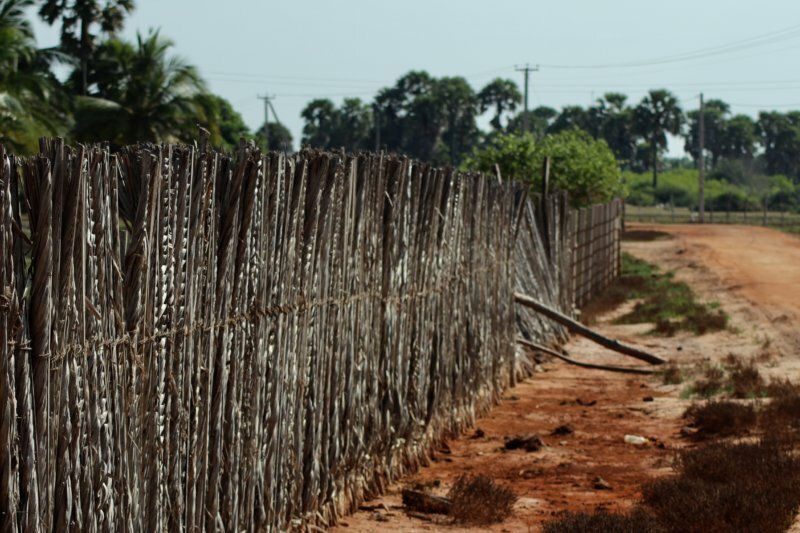 Kalpitiya villages have a slow tempo compared to more developed areas. You can tell these people love their peninsula, their palms, beaches and cows and they can take it easy! Kalpitiya is a perfect tourist destination and still almost undiscovered. So good that we came the long way from Colombo to Kalpitiya! Finding our accommodation was not so easy. Not even our driver had been to this specific place before and we got a bit lost on the bumpy dirt roads that were not the least planned for cars. So we were driving very slowly and to save the car getting off and walking outside the car where it was the most bumpy – and all tuk tuks did it much better! Probably the locals already know where the worst holes are. Then finally we found the right place. We followed these white roadside stones – to our booked accommodation the Villa Kalpitiya. What a villa! It was not a hotel but rather a country house, cottage or villa, but so different from what we normally have in my country and in our climate. Blue and green window shutters, thatched palm roof made of local materials, outdoor living and dining rooms, a sandy garden with a pool and a sandy beach. What more can you demand, we had found a little paradise. Our young hosts Theresa and Udayang were so nice, they met us with a smile and prepared our coffee, dinner and breakfast in their outdoor kitchen and served us to the long table – where we sat alone, with our driver since we happened to be the only guests that particular night. They had planted temple flowers in the hot sand, you can see one of the plants above. What about our room then? All rooms were like in a side building, with doors to a sandy patio. Unlike the public areas our room had all four walls which made me happy. There was a roof too, but all construction was very airy and there was no way to prevent mosquitos from coming in. In addition the bathroom had no roof where the shower was – so the bathroom was partly outdoors. Knowing what mosquitoes spread in tropics I was so worried but there were the solutions: proper evening clothing, mosquito spray and above all mosquito nets. These solutions totally saved us from those hungry insects. I never tried a mosquito net before and was worried if I can sleep at all but I managed it and would certainly do it again. Next summer going to my country cottage in Finland I’ll bring a mosquito net and sleep well. Our 175 km drive from Colombo to Kalpitiya was the initial section on our Sri Lanka round trip. To see what the highlights of Sri Lanka are and how we arranged our trip check out my Sri Lanka main post: What to See in Sri Lanka.